On Monday very early in the morning my sister and I went by taxi to the airport. 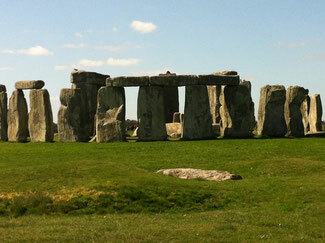 We met a group and flew with Germanwings to London Heathrow We drove to Stonehenge by bus. It was cool, no rain but blue sky and brightly sunshine. Stonehenge is an old cultural monument, about 5000 years old. The sun is shining in a special way between the stones in midsummer. Afterwards we visited Salisbury. 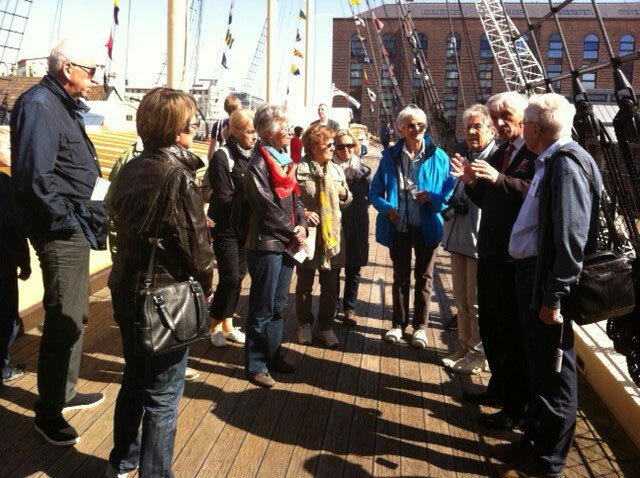 An English guide explained the history and art of the Cathedral with the highest steeple (123 meter) of Great Britain. Here is the best of four remained original documents of Magna Carta (1215) and the oldest functioned church clock of the whole world (since 1386). In this Cathedral is also the oldest completely conserved choir stalls of Great Britain (since 1236). And last not least there is the maximum medieval cloister of GB. Shortly after we walked through the historic section of the town and drank – of course - tea. 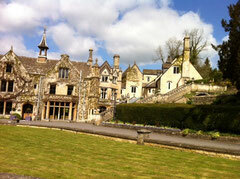 We spent the night in Grittleton House near Chippenham, in the county of Somerset. In former times this “hotel” was a stable, today rebuilt to a very simple hotel. On Tuesday the owner of the Castle Grittleton showed us his 500 years old property. Now he runs a private day school for children in the age of 1 to 16 years, in order to have enough money to pay the enormous costs: 500.000 £ a year. In the afternoon we drove to Bristol and inspected the motor sailor “BRUNEL’S ss GREAT BRITAIN”, the world’s first great ocean liner. She sailed 78 times to Australia and her last voyage was to the Falkland Isles. Now she is a museum. 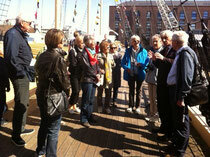 It shows the dramatic conditions of people who travelled in former times. 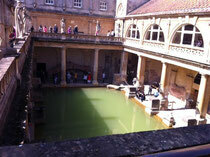 On Wednesday we investigated Bath, the oldest (60 AD) and most famous Roman spa. It was built around the natural hot spring which rises at 46° C. In the same town we had a look into the lovely abbey, not dark and grey but bright and white. An abbey is a church, where no bishop rules, in opposite to a cathedral. In Bradford on Avon we had an afternoon tea in a Queen Victoria style house. The next destination was Lacock. This is a listed medieval village which belongs to the world cultural heritage. It was also the scenery of the films “Harry Potter” and “Pride and prejudice” (in an accordance with the book “Sense And Sensibility”, written by Jane Austen). On Thursday we travelled to Cardiff and climbed the Norman Keep (tower with very narrow and steep steps) in the courtyard of the castle. Thereupon we went shopping in the town centre, with a lot of shops under covered footpaths. We also saw the giant Millennium Stadium, the national stadium of Wales for football and rugby, built 1999 and has 74500 seating capacity. In the afternoon – it was the first time without blue sky and sun – we got to know the Brecon Mountain Railway in the Nationalpark Brecon Beacons, one of the most popular railways in Wales, built in 1859 and closed in 1964. On Friday, the last day of our journey, we hiked to Castle Combe. It’s an old village from the 14th century and perfect for the film scenery, for example “Doctor Doolittle” (1966), “Harry Potter” (first part), “Stardust” and “War Horse” (production of Steven Spielberg). The 5-star Manor House Hotel was also built in the 14th century. It’s a hotel for rich people (1 night 500 £). In the evening we flew back from Heathrow to Stuttgart and arrived 20 minutes earlier than planned. Here it has rained. We all were very astonished about the difference of climate feeling between German and English people: We Germans had worn warm clothes (long trousers, pullover and jackets), the English had worn short trousers, no stockings, only T-shirts, and the girl children thin dresses like we in hot summer!